Breast cancer is the most common cause of cancer in women and the second most common cause of death for women in the U.S. (It’s the leading cause of death for women between the ages of 45 and 55). There is so much work that can and needs to be done to improve awareness and women’s health. 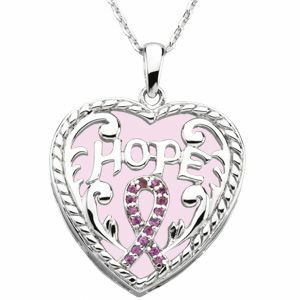 The pendant, with the word Hope on it, is a reminder that there is hope in detecting and being cured from the disease. This pendant was designed with a heart, which symbolizes the concern all women have for their sisters throughout the world. From Deborah J. Birdoes’ extraordinary Inspirational Blessings Collection of Jewelry. This item comes with an 18in chain, a gift box, and a card with message.